Since the day INGLOT has opened its doors in the capital, I can't get enough of it. 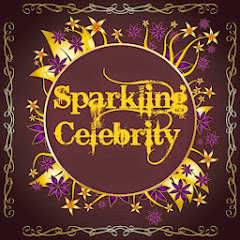 I went for a detailed visit to get all the possible swatching and price info for my Sparkling readers. Read More for a fab Pictorial Experience!!! Founded over 30 years ago in Przemyśl, Poland, INGLOT Cosmetics is now one of the world’s leading manufacturers in colour cosmetics. INGLOT currently has a presence at all major beauty happenings and events around the globe, from the runways of Fashion Week to the stages and sets of TV and Broadway musicals. 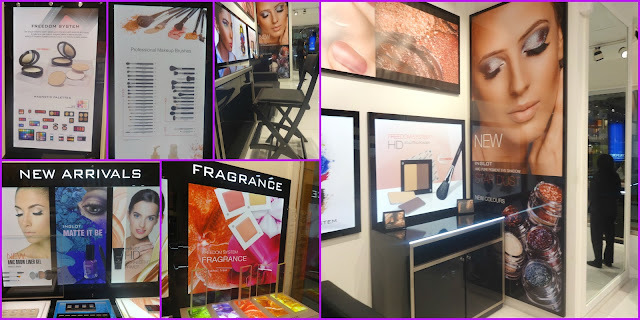 The international expansion of INGLOT began in 2006 with the opening of its first franchise store in Montreal, Canada. Fast growth and development of the company soon resulted in becoming available in over 70 countries including more than 600 boutique stores in world’s most prestigious places. 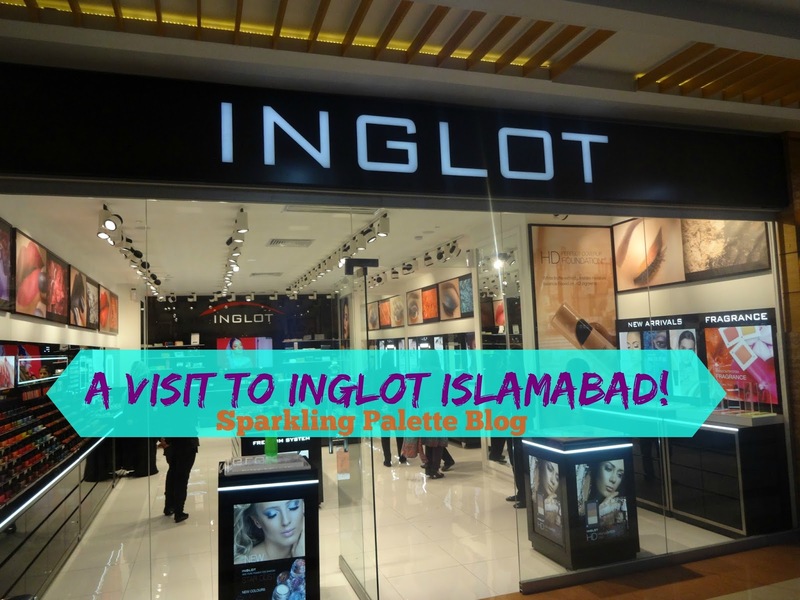 The INGLOT studio is on the third floor in Centaurus Mall, Islamabad. It is a spacious place, which can be easily termed as "heaven"for a makeup lover. all the counters on laft and right, including the display tables in the center are brimming with makeup (testers) and popping with colour. Under one roof you will find all the products for contouring to concealing to highlighting to colour... pheewww! Cosmetics from nails to face to lips to cheeks to body! 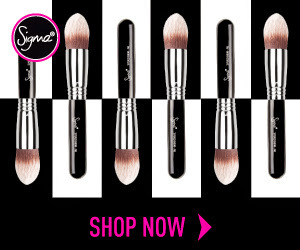 Yes INGLOT has that wide range for daily and professional makeup usage. Let's start from the counters on the left side,as we move in the store. Then comes LIPS counter,, filled with testers from lip pencil, lip liners to lip products of all type (glosses and lipsticks) Here a variety of finish is also found from glossy, matte to sheen and shimmer. Inglot has a variety fo Lip liners, from twist-able liners to simple pencil liners. 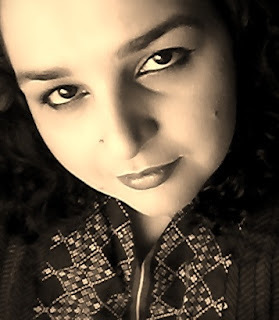 Price ranges from Pkr 900/- to 1150/-. EYES display counter is all fun and colour-full. Inglot has all professional cosmetics and tools here from brushes to lashes to pencils to pigments, and their best seller Gel Liner. Inglot Freedom System, give you freedom of choosing and making your own palette. You may choose any colours from Eyes, lips or face, and enjoy your freedom Palette. Prices are different. For face there is also loose powder and powder compacts too. Some colours for cheeks, here you can see quads, bricks in shimmer and matte. Prices can be seen in pictures. For further details visit Inglot Pakistan of FaceBook and do check the WEBSITE. P.S: Special Thanks to Team INGLOT for all the co-operation for and during this visit. Follow #SPBlovesInglot on Instagram, Facebook and Twitter. Hats off to you for this detailed virtual tour of Inglot Studio. All the products look great. Loving the eyeshades that you swatched. Need to visit the outlet soon. Wow what a detailed post on the shop. Very nicely captured pictures! 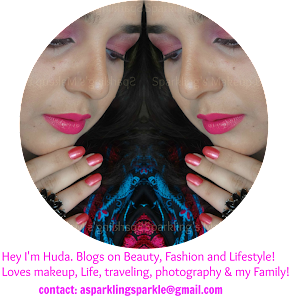 This post is such a treat *_* I loved their eye pigments, glitters and slim gel lipsticks!